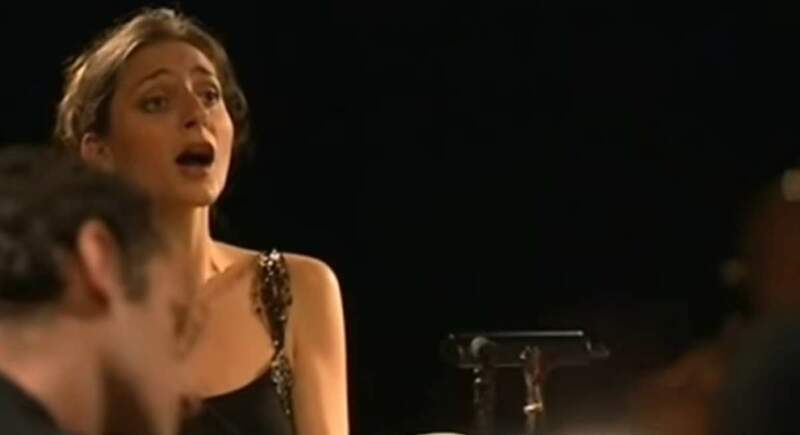 Accompanied by the period ensemble Les Siècles, French contralto Delphine Galou sings “Erbarme dich, mein Gott” (English: Have mercy, my God), an aria for contralto, solo violin, strings (originally 2 violins and 1 viola) and basso continuo, from the sacred oratorio “Matthäus-Passion” (English: St Matthew Passion), BWV 244 written by Johann Sebastian Bach in 1727. Solo violin: François-Marie Drieux. Conductor: François-Xavier Roth. Delphine Galou was born in Paris in 1977. Additionally to her studies of philosophy at the Sorbonne, she also studied the piano and singing. In 2004, she was selected “Discovery of the Year” by the French Association for the Promotion of Young Artists ADAMI. She started her career as a member of the ensemble of the “Jeunes Voix du Rhin”. She then decided to specialise in the baroque repertoire, collaborating with ensembles such as Balthasar Neumann Ensemble (Thomas Hengelbrock), I Barocchisti (Diego Fasolis), Accademia Bizantina (Ottavio Dantone), Collegium 1704 (Václav Luks), the Venice Baroque Orchestra (Andrea Marcon), Il Complesso Barocco (Alan Curtis), Les Siècles (François-Xavier Roth), Les Arts Florissants (Jonathan Cohen), Le Concert des Nations (Jordi Savall), Ensemble Matheus (Jean-Christophe Spinosi), Les Musiciens du Louvre (Marc Minkowski), Le Concert d’Astrée (Emmanuelle Haïm), Les Ambassadeurs (Alexis Kossenko) and Les Talens Lyriques (Christophe Rousset). She has performed at Théâtre des Champs-Elysées, Angers Nantes Opéra, Opéra de Montpellier, Royal Opera House London, Theater St Gallen, Theater Basel, Handel Festival in Karlsruhe, Schwetzingen Festival, Staatsoper Berlin, Theater an der Wien and the Maggio Musicale in Firenze. As a concert soloist, she is a regular guest of the Beaune Baroque Festival where she was acclaimed in Rinaldo and Alessandro by Handel, Semiramide by Porpora, Juditha triumphans and Orlando furioso by Vivaldi and, in 2013, in L’incoronazione di Dario (Vivaldi again). This season was highlighted by her US debut at the Lincoln Center in New York in Handel’s Aci, Galatea e Polifemo with Le Concert d’Astrée and Emmanuelle Haïm. She has also performed meanwhile with Les Musiciens du Louvre Grenoble, Les Ambassadeurs and toured a recital program with Les Talens Lyriques (around the biblical theme of Juditha triumphans). During the 2015/16 season she sang Stabat Mater by Pergolesi with the Orchestra Filarmonica della Scala in Milano, Mass in b minor by Bach with the Orchestra Sinfonica della Rai di Torino, The Messiah by Handel in Basilea with La Cetra di Marconi, Belshazzar, Alcina and Johannes Passion with the Accademia Bizantina and Matthäuspassion with the Holland Baroque Society. Among her recent engagements are productions of Orlando (Medoro) at Opernhaus in Zurich, L’Orfeo (La Musica) at Opéra de Lausanne. She received great acclaims in Belshazzar in Salzburg, Beaune, and Bruges with the Accademia Bizantina, Juditha Triumphans in Bruxelles and London with the Venice Baroque Orchestra, as well as in concert with the Orchestra Haydn in Bolzano. Her projects include L’incoronazione di Dario at Teatro Regio in Torino, Rinaldo (Goffredo) with the Kam- merorchester Basel, Giulio Cesare (Cornelia) during a tour with the Accademia Bizantina and L’Incorona- zione di Poppea (Ottone) in Zürich. Her numerous discography includes the Saint John Passion by Bach with Marc Minkowski (Naïve), Vivaldi’s Teuzzone under Jordi Savall (Naïve) and Vivaldi’s Orlando 1714 under Federico Maria Sardelli (Naïve), Vivaldi’s L’incoronazione di Dario and Rossini’s Petite messe solennelle under Ottavio Dantone (Naïve), Steffani’s Niobe with Thomas Hengelbrock (DVD Opus Arte), Caldara’s La Concordia dei’ Pianeti under Andrea Marcon (Deutsche Grammophon) and Ravel’s L’Enfant et les Sortilèges with the Orchestre National de Lyon and Leonard Slatkin. Les Siècles is an orchestra created in 2003 by the French conductorFrançois-Xavier Roth, whose ambition is to put in perspective works from the 17th to the present day. The musicians of this orchestra play each repertoire on the appropriate historical instruments.